It was a welcome home ceremony 50 years in the making. Alaska Air Group and the USO Northwest officially honored Vietnam-era veterans during a celebration this fall at the Seattle hangar. “On behalf of a grateful nation, we want to officially welcome you home,” said Greg Mays, vice president of maintenance and engineering. The event was one of many 50th anniversary commemoration events around the United States to thank and honor those who served. About 40 veterans, including some Alaska and Horizon employees, entered the Seattle Hangar through a lineup of cheering family members, welcome-home signs, and Patriot Guard motorcycle riders who held American flags. During the keynote speech, Alfie Alvarado-Ramos, director of the Washington State Department of Veterans Affairs and herself a Vietnam-era veteran, spoke of the difficulties that many veterans faced when they returned home in the 1960s and 1970s. She thanked Alaska for its continuous support of veterans, and noted that more than 1,000 veterans work for the company. “Your commitment at Alaska Airlines is unwavering, and for that I thank you,” Alvarado-Ramos said. 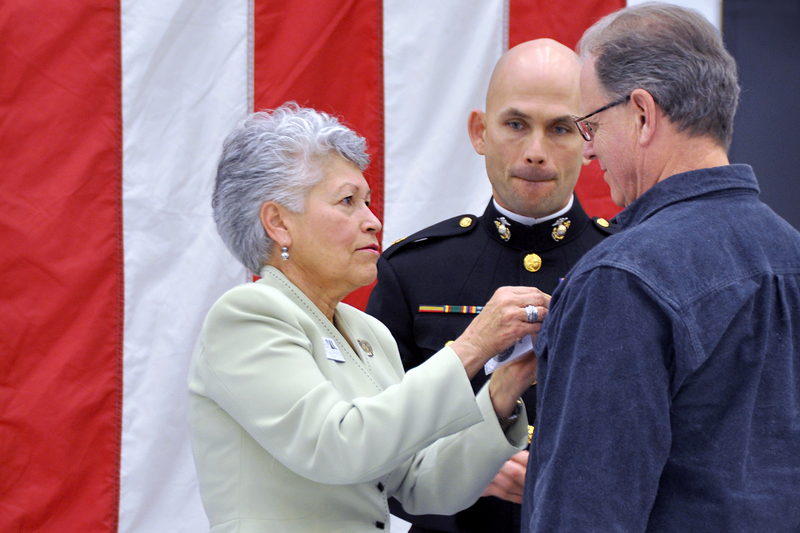 Each of the honored guests was recognized individually by name, and given a pin and a coin. “A lot of these guys deserve the recognition, and I appreciate the work that everybody put into this event,” said Ernie Henderson, who has worked for Alaska for 35 years and served in the Army in 1970-71. Gary Stebner, a veteran who attended the ceremony with his daughter Ashleigh Stebner, an Alaska flight attendant, said he could relate to what Alvarado-Ramos said about how hard it was for Vietnam veterans to come back to the U.S. after the war. The event was organized by Air Group’s Military/Veteran Employee Resource Group, a group of volunteers who take on the responsibility to enhance the connection between the military community and our company. Ron Foster, an Alaska mechanic for 31 years, also appreciated the recognition. “It was a very nice gesture by the company and all of those involved,” said Foster, who also serves as treasurer on the A-3 Skywarrior Whidbey Memorial, a group that is restoring one of the Vietnam-era airplanes to honor the crews who flew and supported the aircraft and its missions. 5 comments on "A welcome home for Vietnam-era veterans"
I think it was great to welcome back my fellow vets! I was an Air Force Medic and served from 1967 to 1971. My wife and I are Alaska Airline fans!